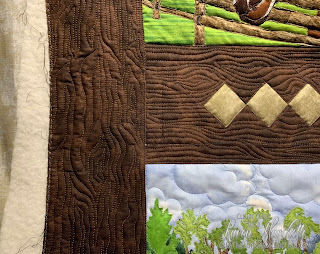 After quilting like a mad person (trying to stay on schedule), this morning I finished Susan's Acorn Trail quilt. 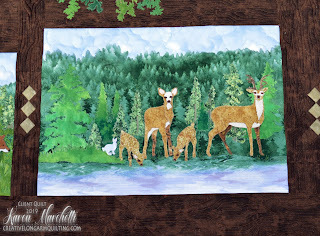 The pattern is by Black Mountain Quilts. I've just finished Shay's Lake Lanier quilt. And please forgive my not-so-excellent photography skills... and by not-so-excellent, I mean totally lacking today! 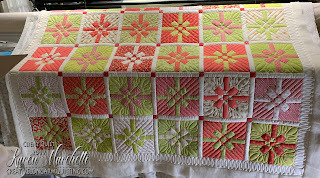 Wouldn't you know it, as soon as I take the picture the wind blows... ugh! 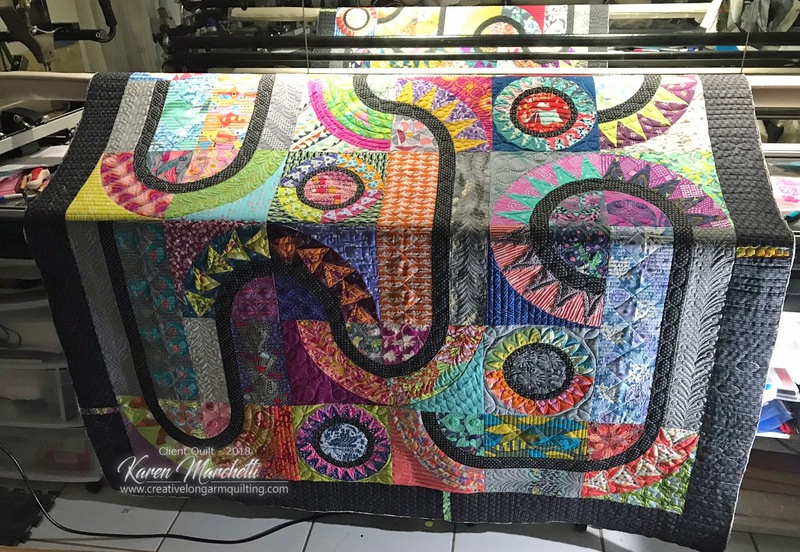 Just forgive that little curling corner, it's not really curling. 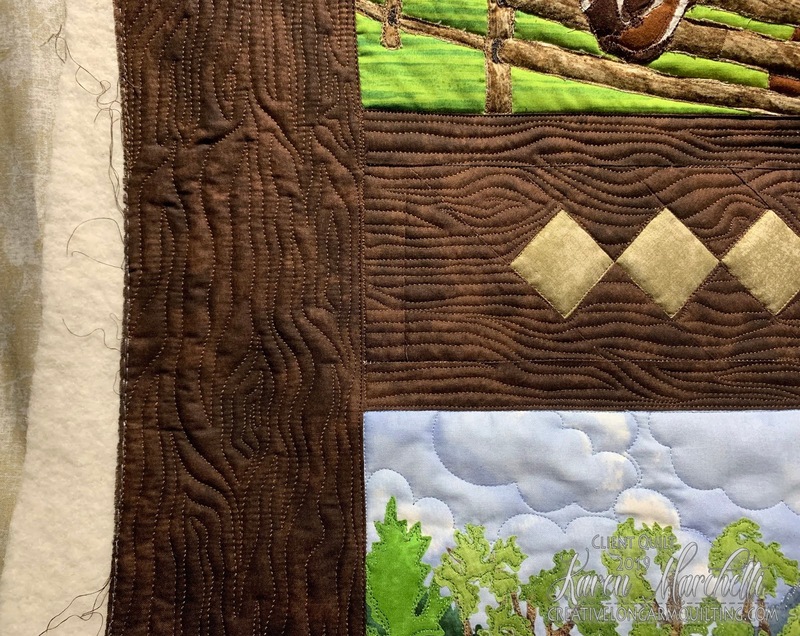 On the name block I added some black thread to make it appear like a distressed piece of wood. 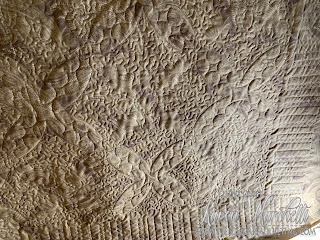 The entire border/sashing is done as tree bark. 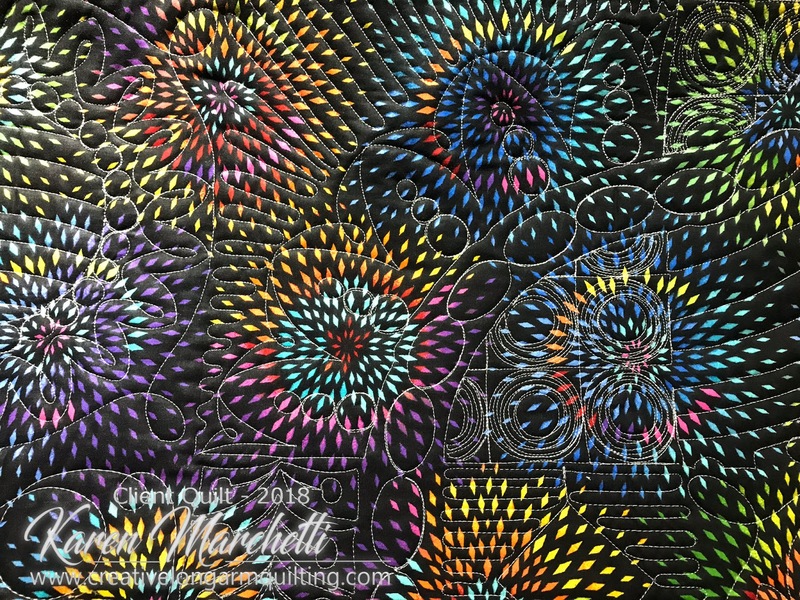 I just wanted this to stand out on its own. 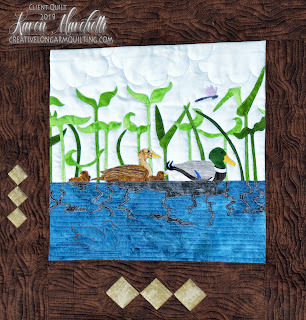 And a special request by Shay was to have a duck stitched in the water on the ducks block - voila! 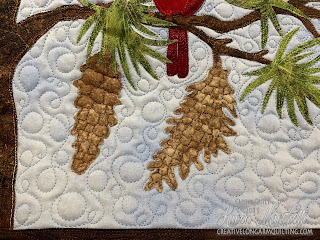 You can watch me stitching this pinecone detail here. 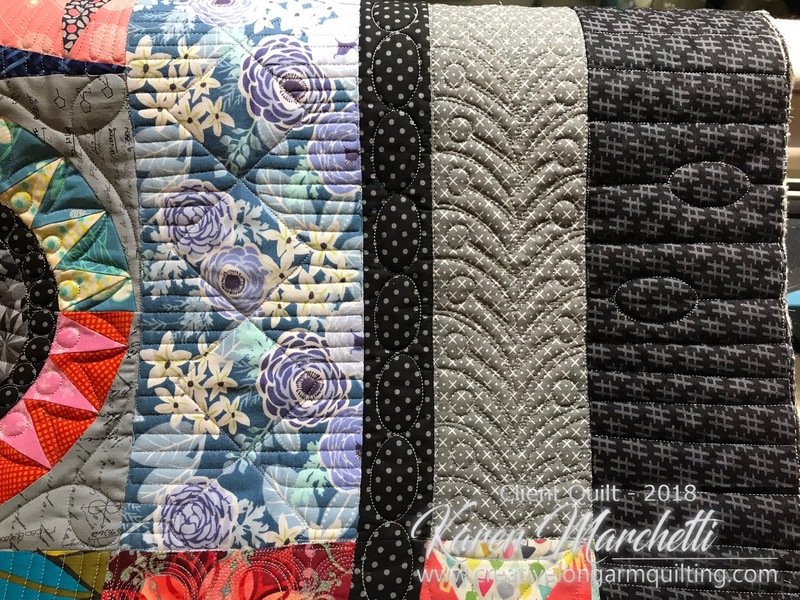 This was a super fun quilt and I think it turned out pretty awesome! 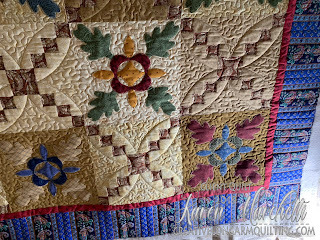 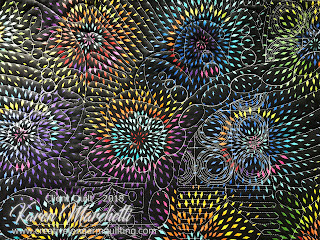 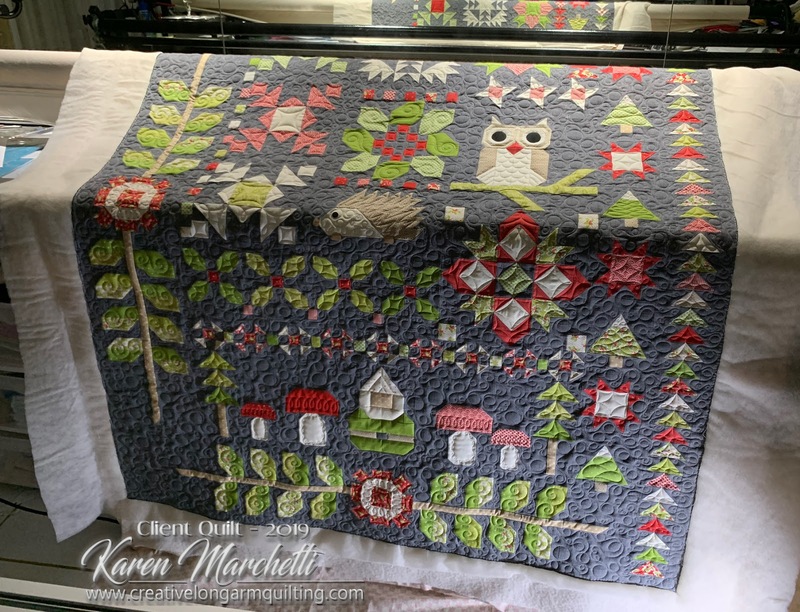 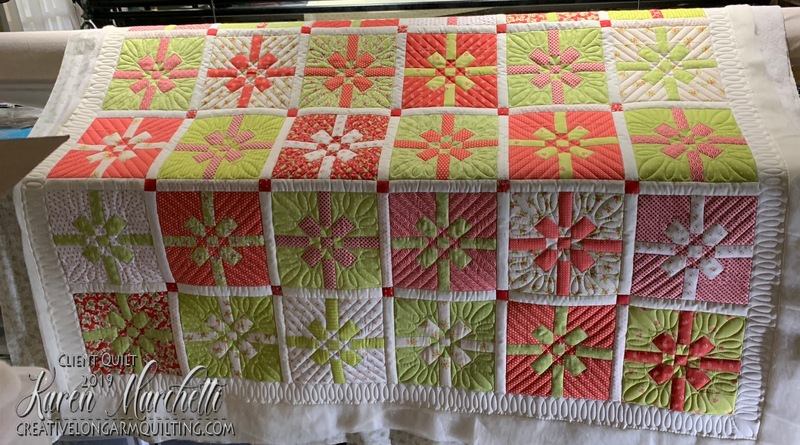 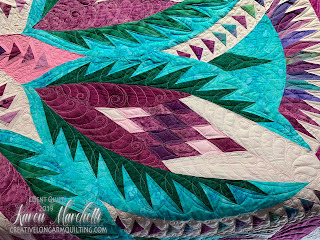 I've just finished this awesome tumbling blocks quilt for Carol - I just love her use of colors on this! 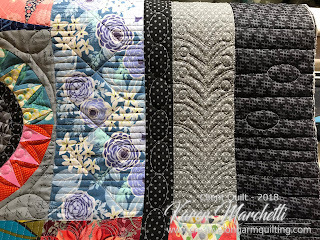 Oh, and there was just a little wonkiness going on in the one border. I've just finished another super cute quilt for Rosamond! 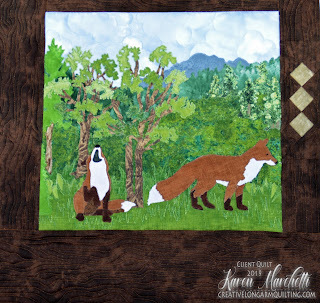 This one is Woodland Wonderland, also by Fig Tree. 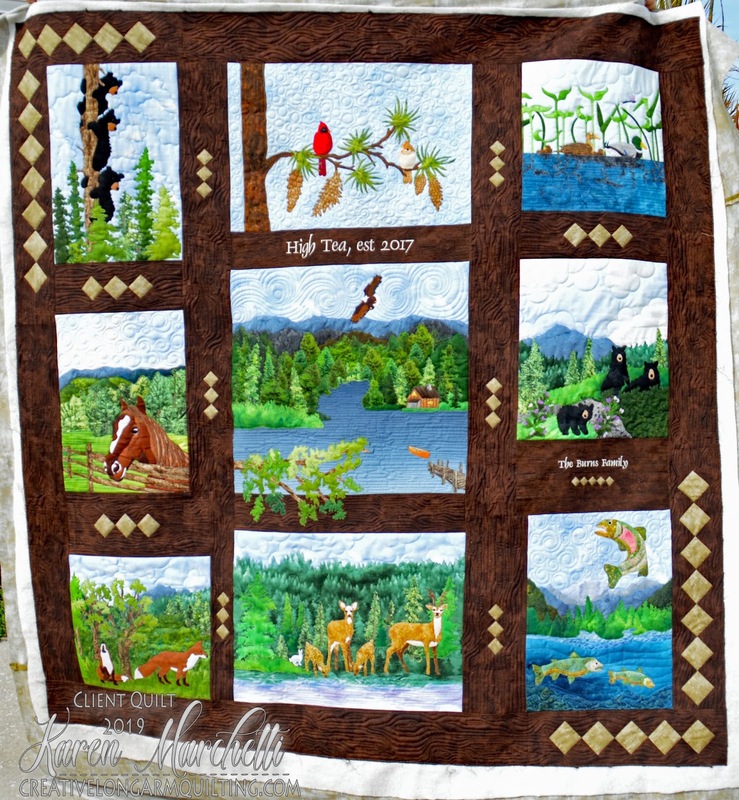 And a few detail pics -- love the critters! 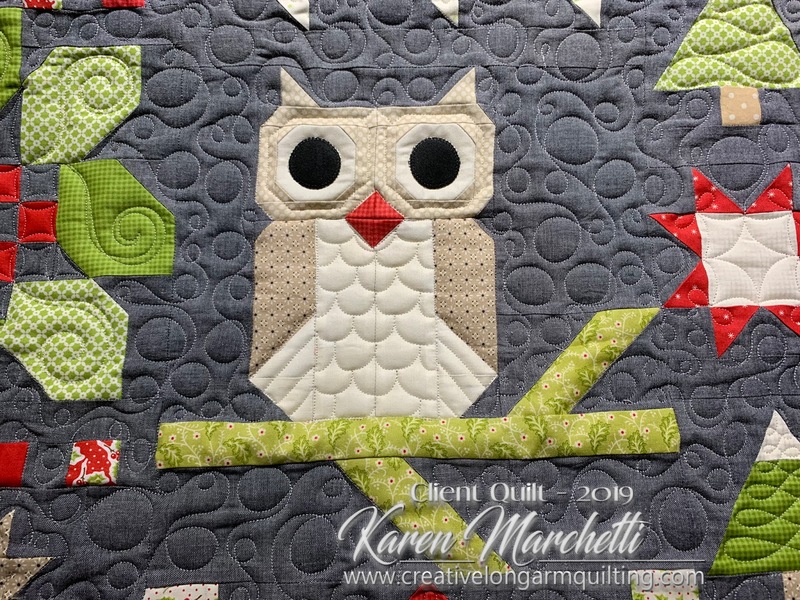 It turned out super cute - and the next one will be identical so probably no duplicate pics. 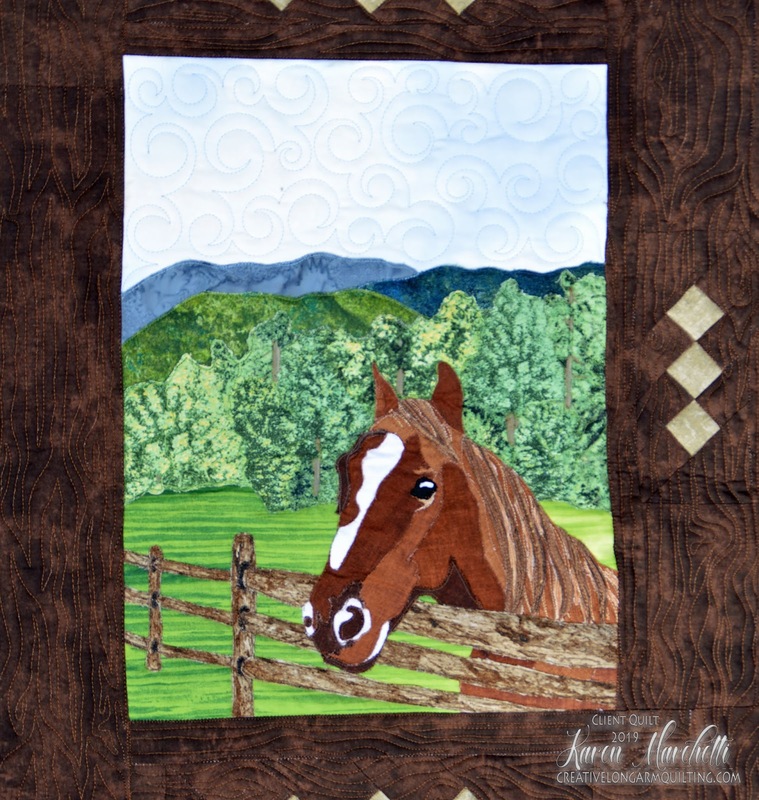 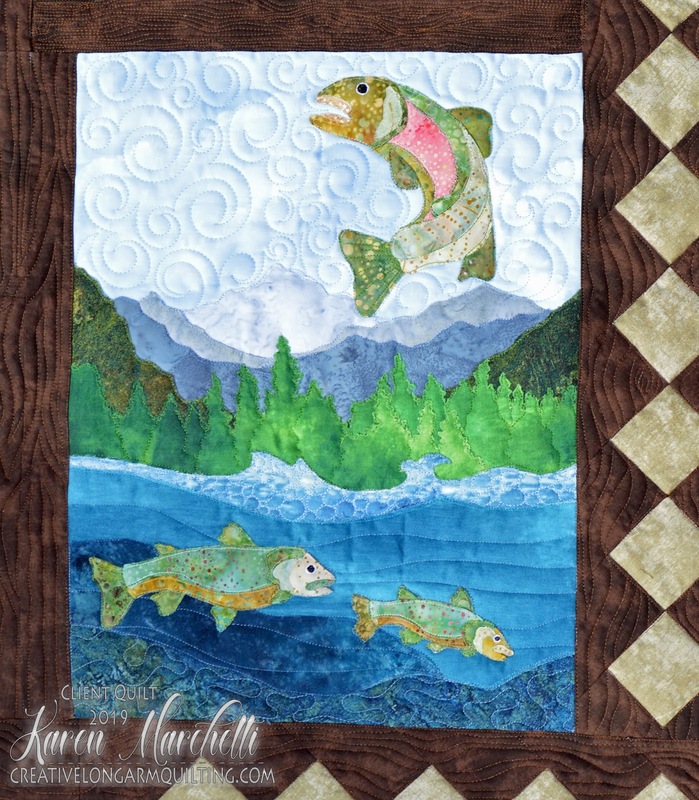 Here is Andrea's beautiful quilt. 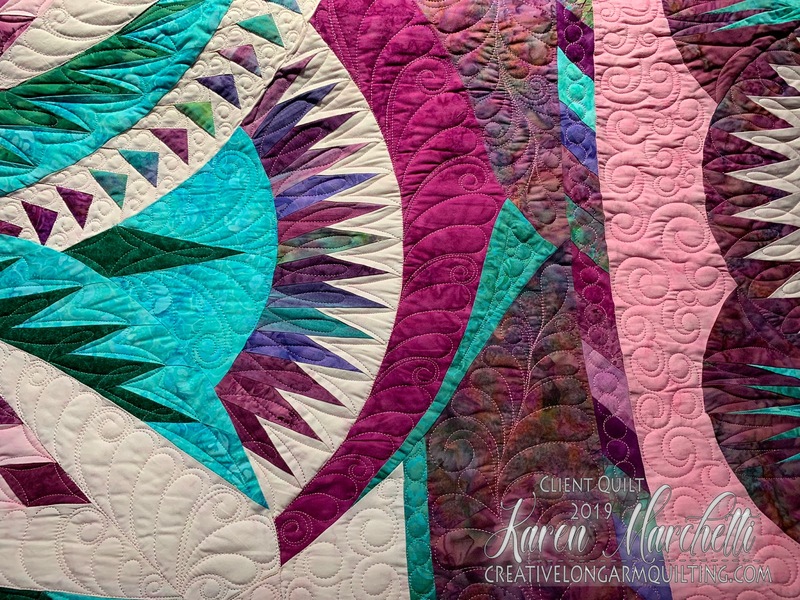 The pattern is Reaching Out by Edyta Sitar/Laundry Basket Quilts. 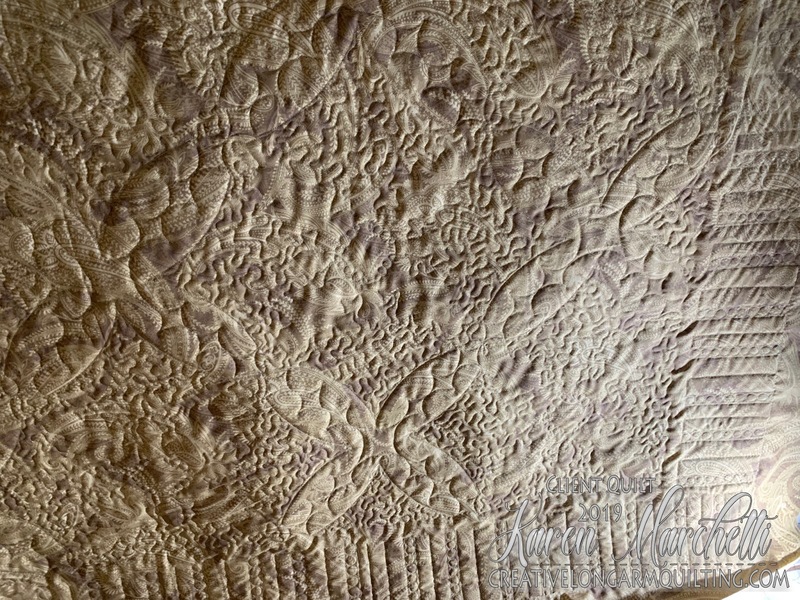 Andrea only had two requests - keep it soft (not dense quilting) and no feathers. 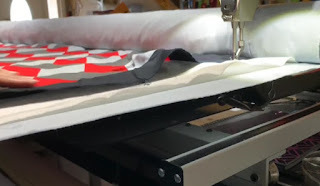 I've been crazy busy writing, drawing, editing, and now finishing! Let me introduce you to Fast Forward Feathers, my fourth book. 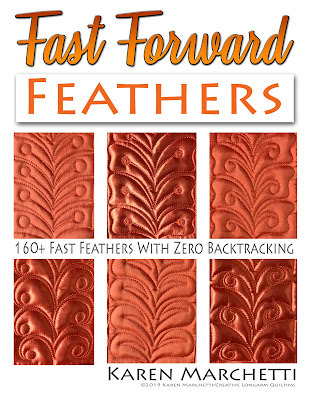 It has over 160 fast forward feather options -- all of which require ZERO backtracking! 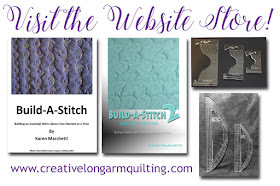 The book is 106 pages and will be spiral bound. 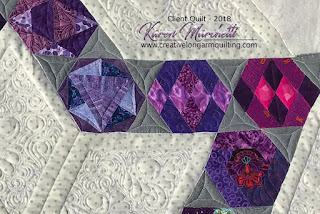 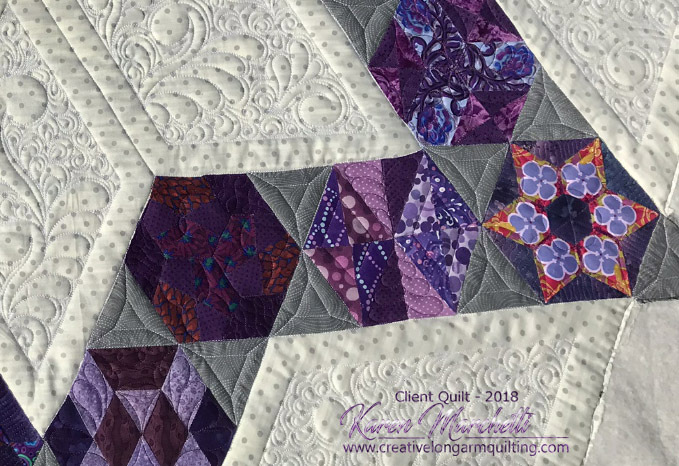 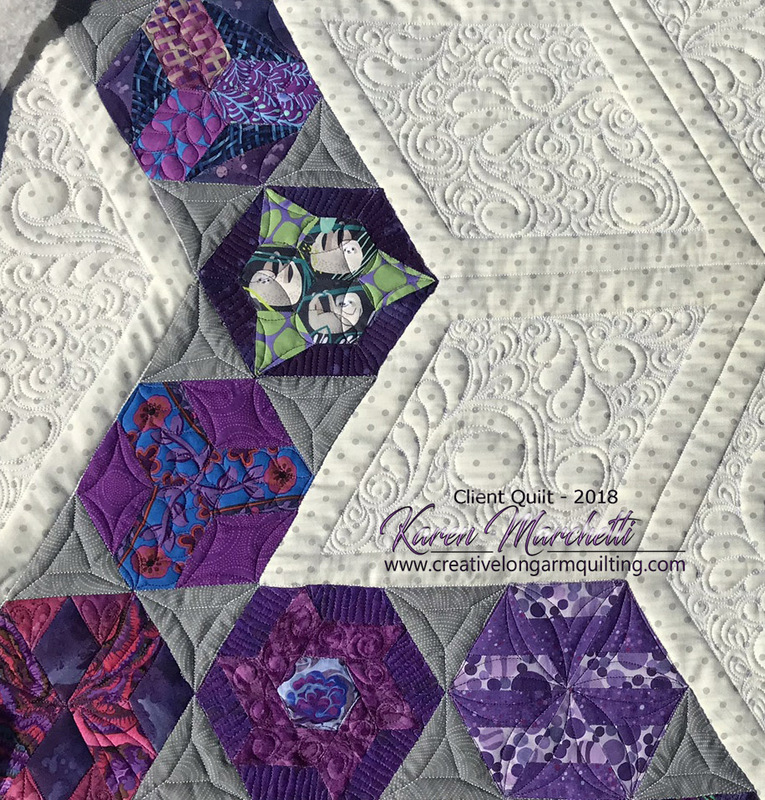 The PRESALE link is for US orders only, if you're international and would like to order, email karen@creativelongarmquilting.com for shipping rates. 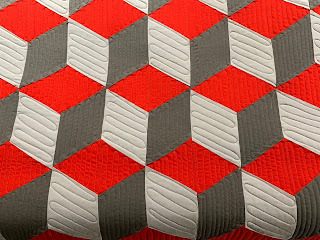 Oh, and a little teaser... there's more big news coming very soon! 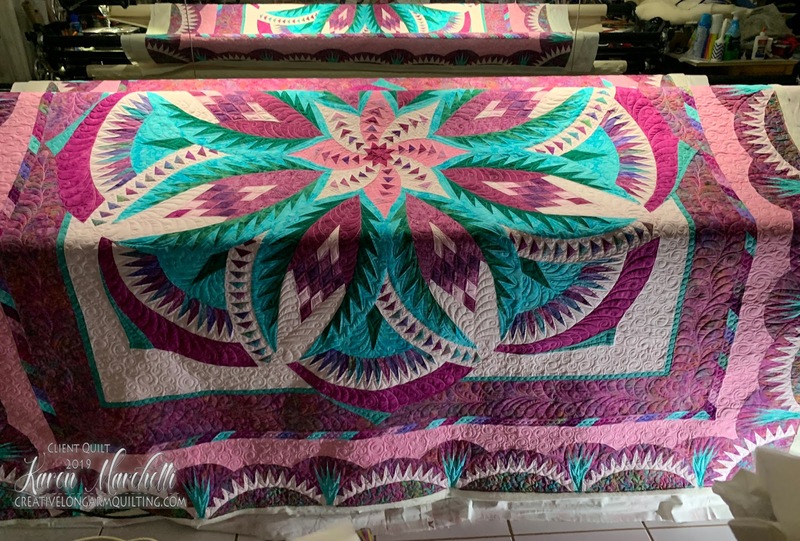 The last two quilts of the year are finished. 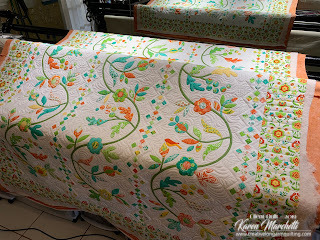 These two beauties belong to Kathy and I stitched on them using the Elevate. 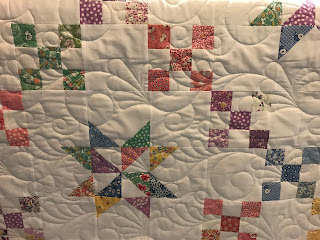 Here is Kathy's third Nine Patch and Stars in 30s repro fabrics. 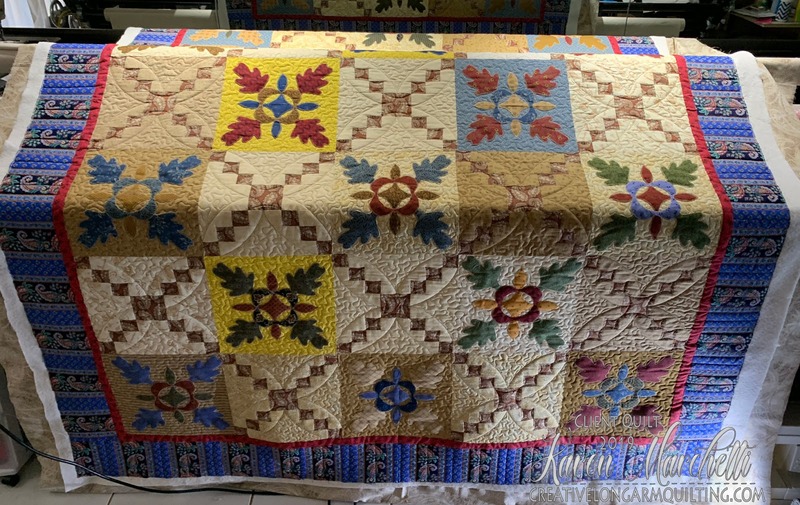 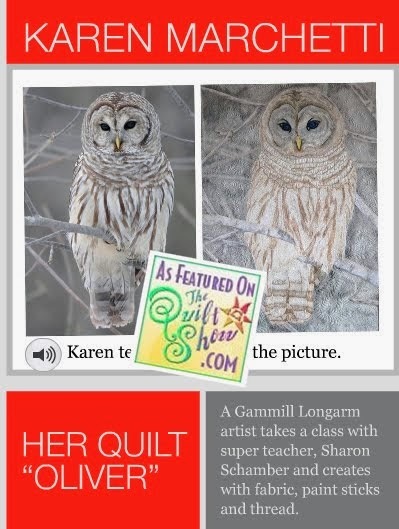 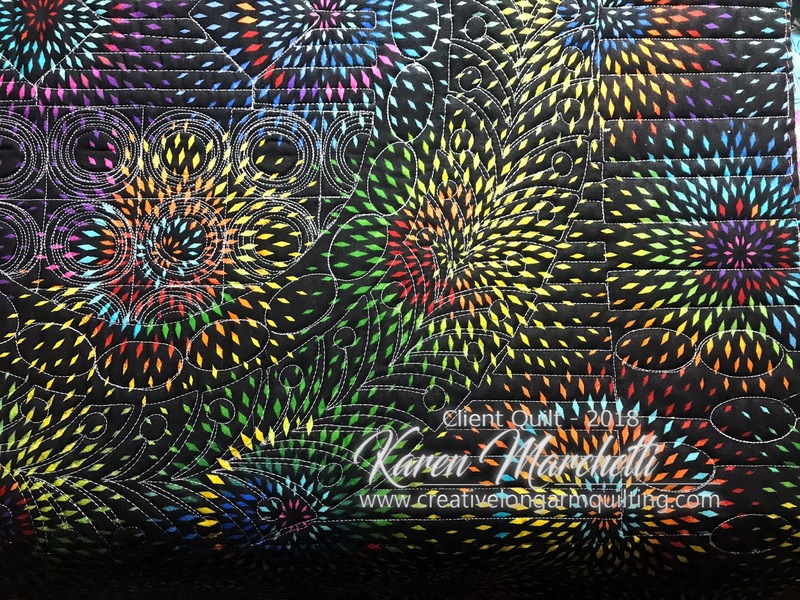 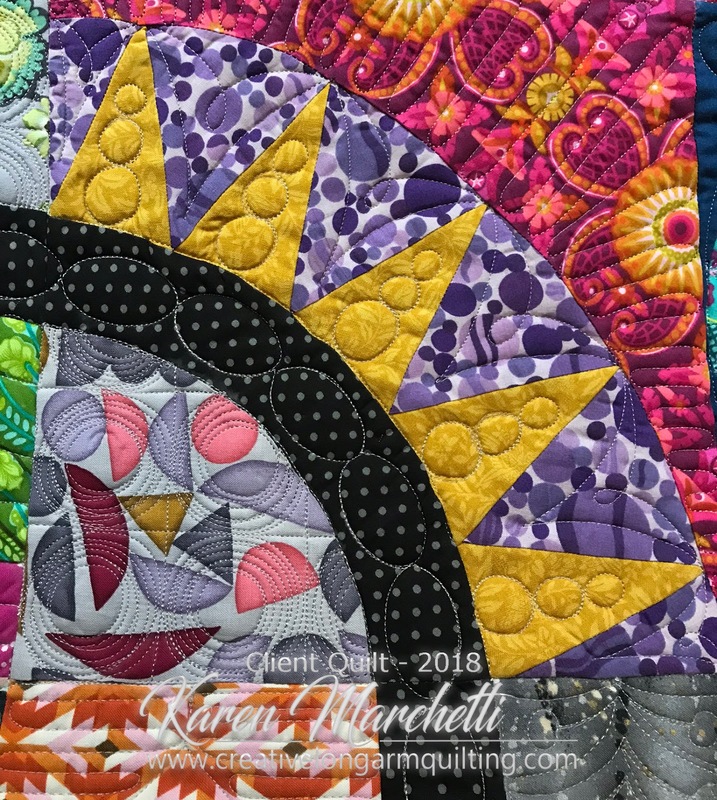 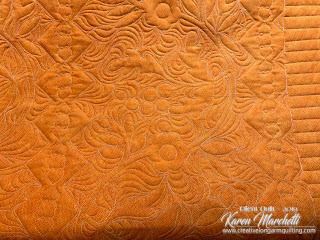 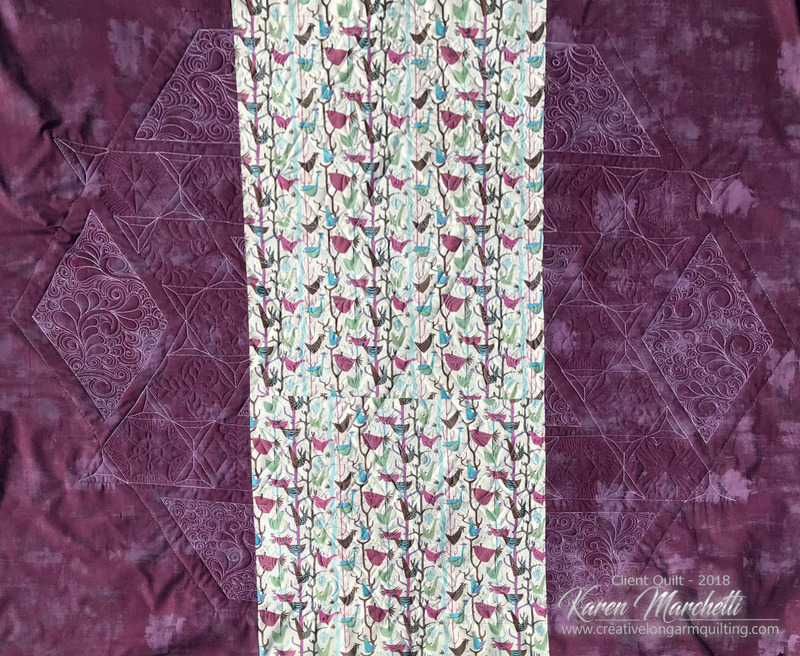 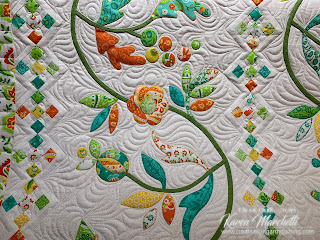 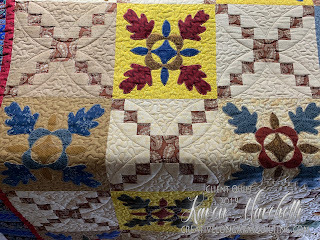 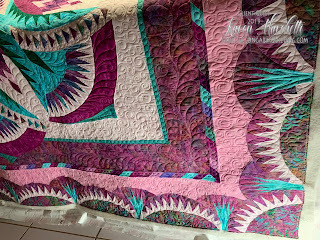 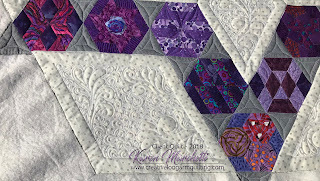 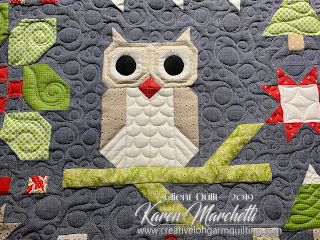 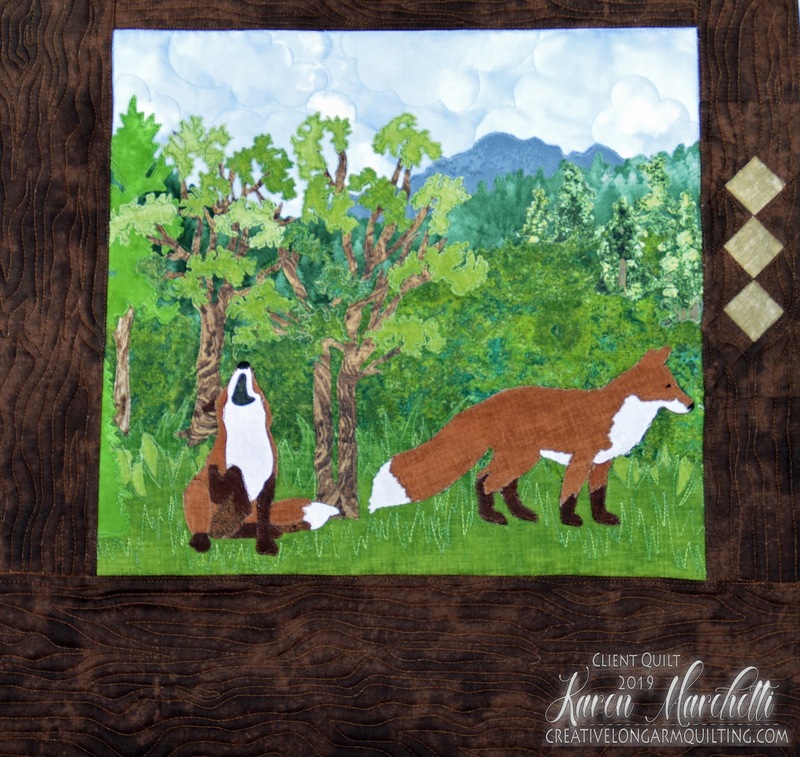 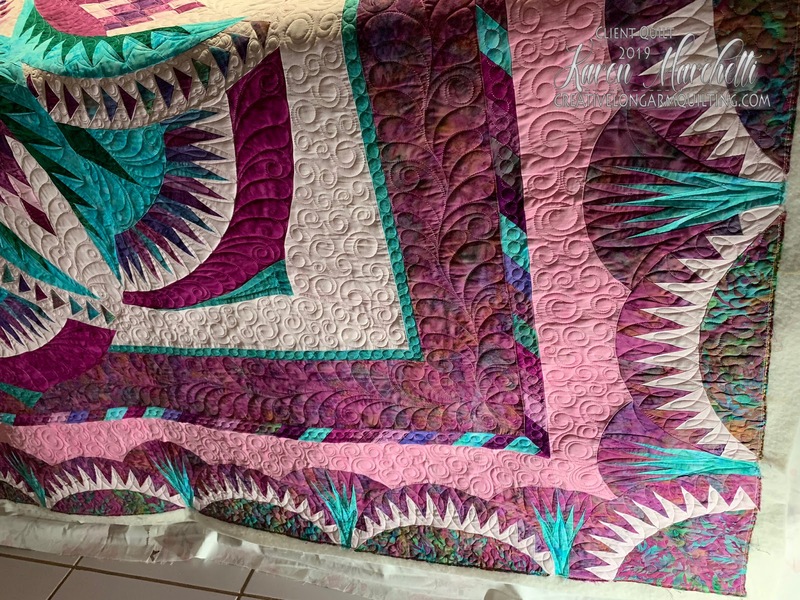 This was quilted using Swirls & Feathers design by Judith Kraker. 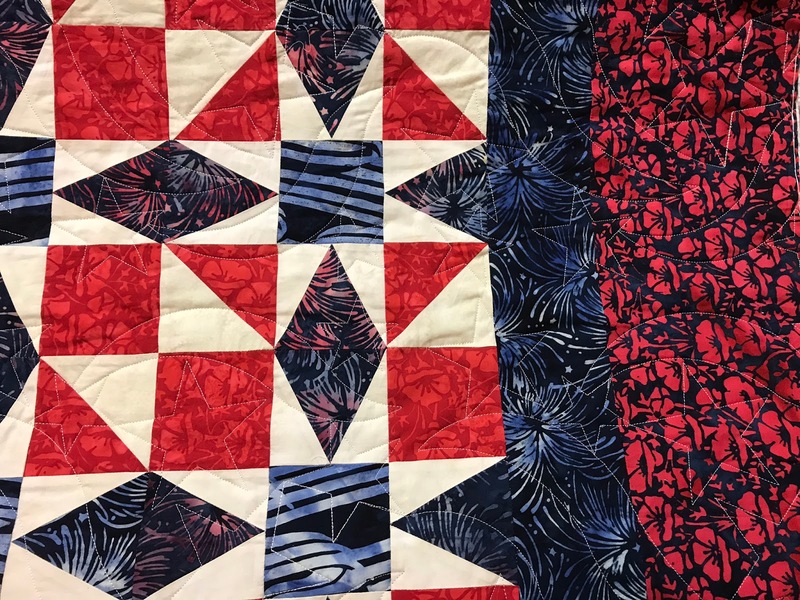 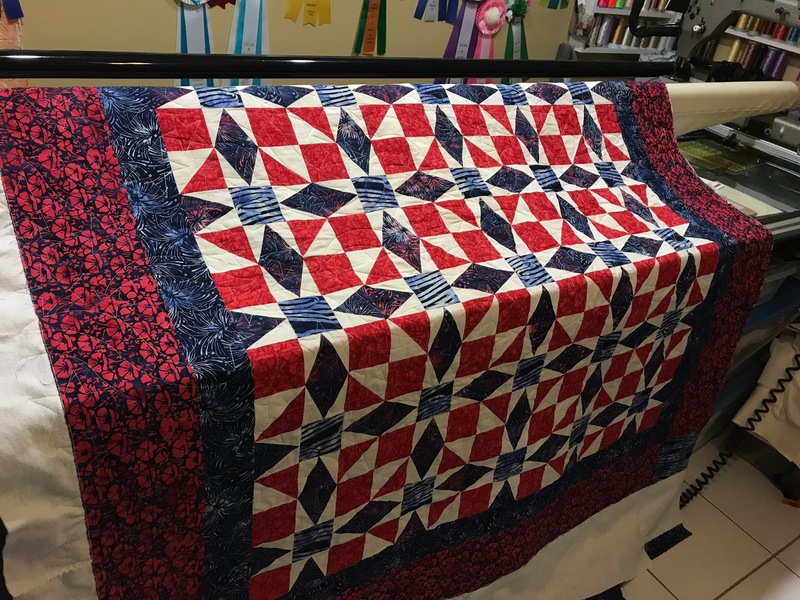 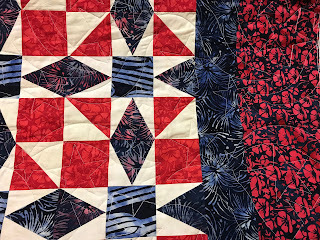 And here is Kathy's Red White & Blue quilt using Star Spangled Banner design by Karen Farnsworth. 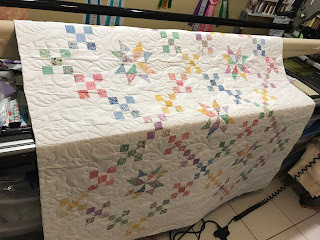 Late last night (or maybe the wee hours of today depending on how you look at it) I finished Silvia's Road Less Traveled quilt. 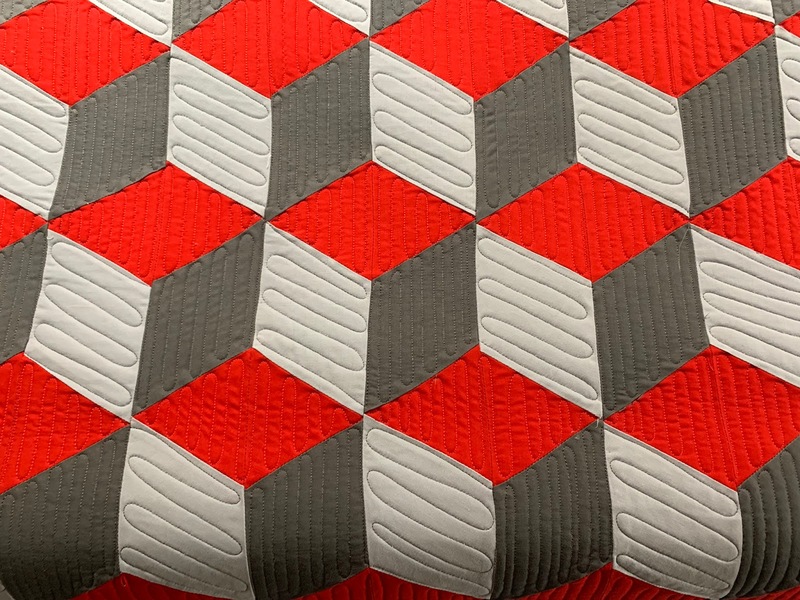 The pattern is Road Trip by Chris Jurd. 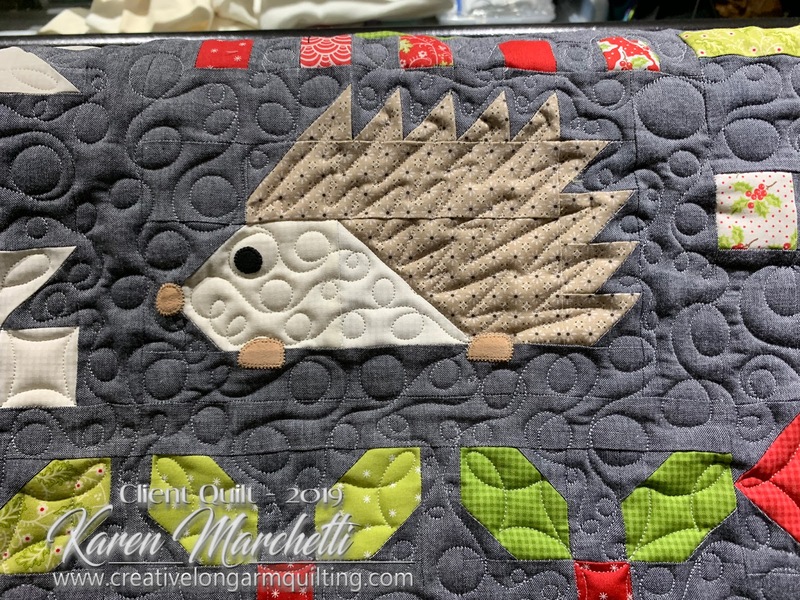 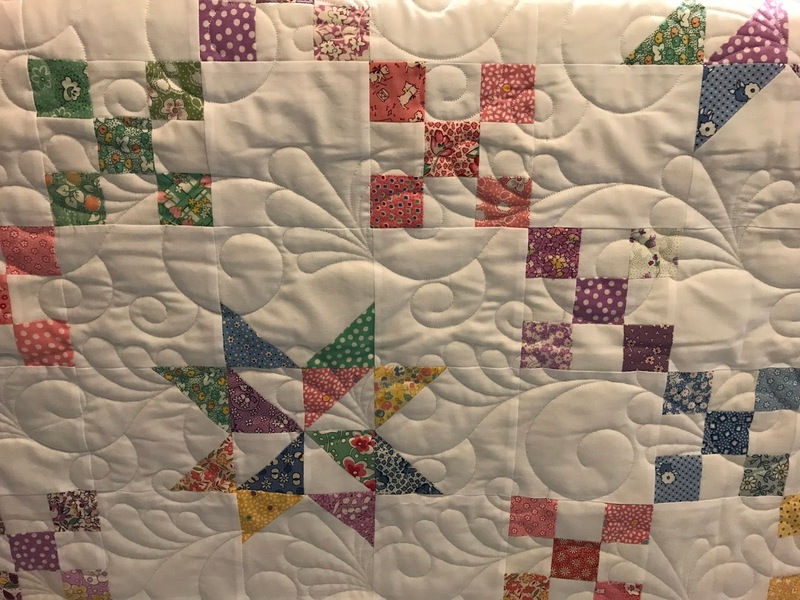 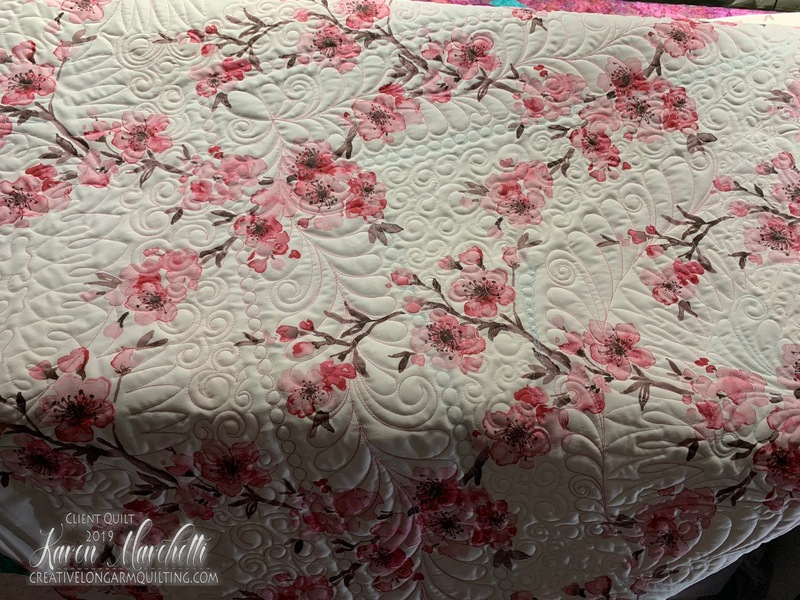 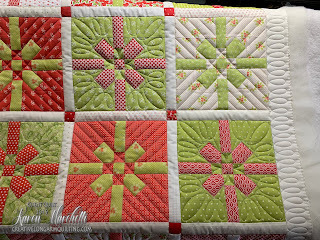 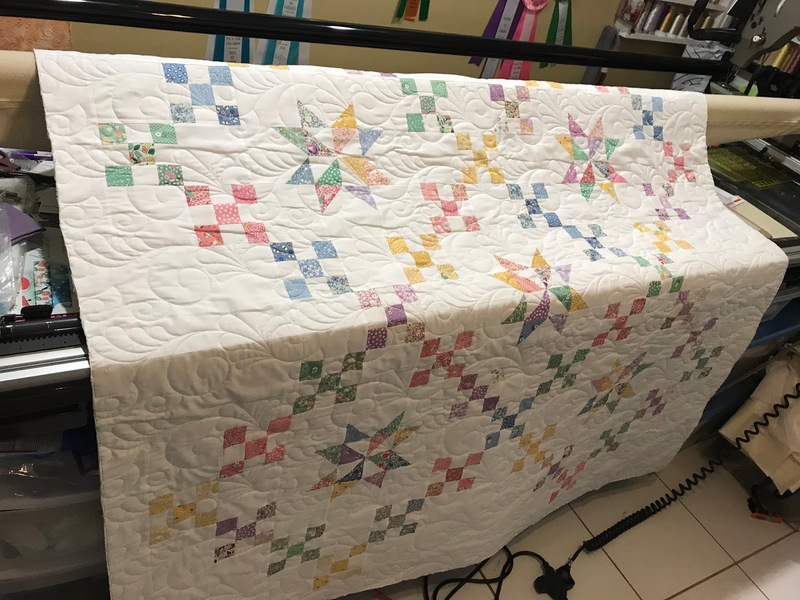 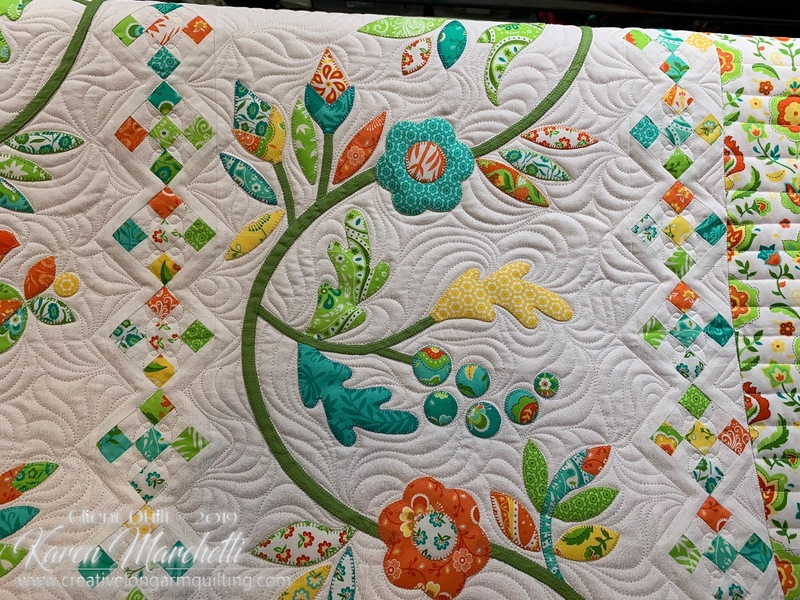 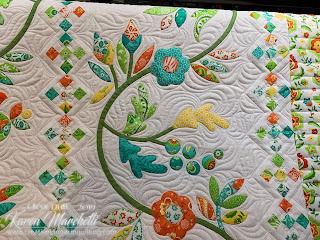 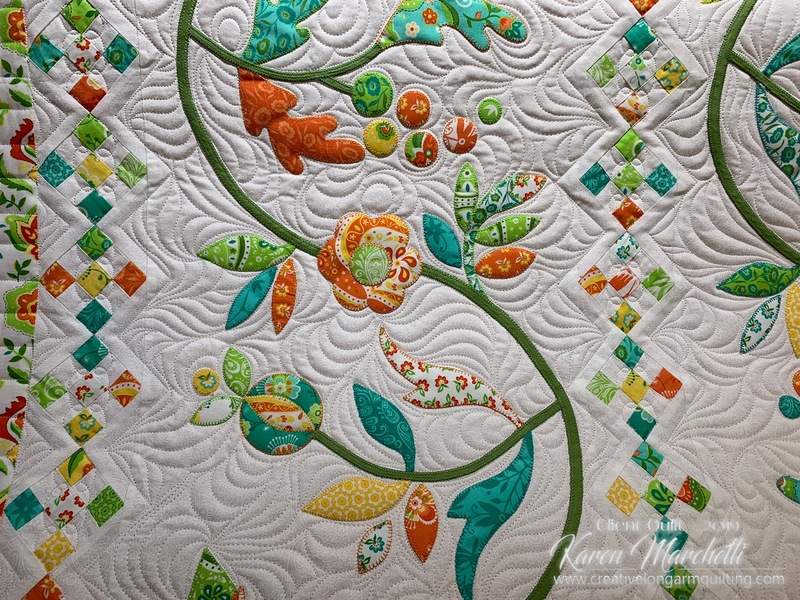 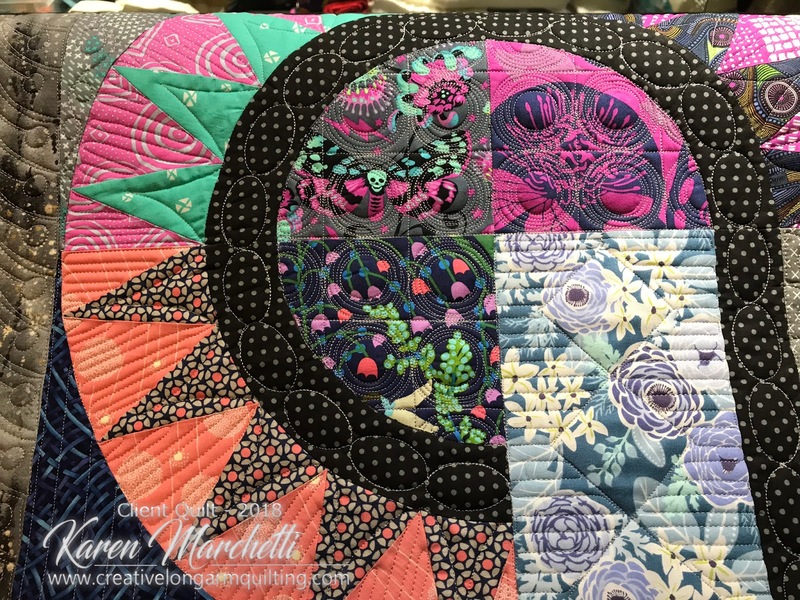 I tried to keep the quilting as eclectic as Silvia's many fabric choices! 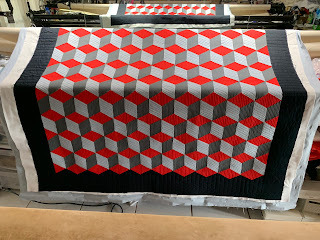 I know these aren't the best photos - remember, it was late and today's weather is drizzly and grey so this is what we've got! 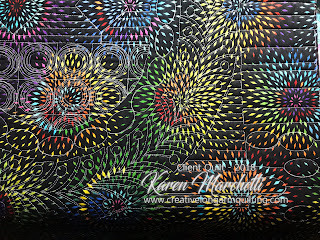 In the photo above and below you can see the result of one of my favorite stencils by Jodi Robinson, it's called Circle Pop. 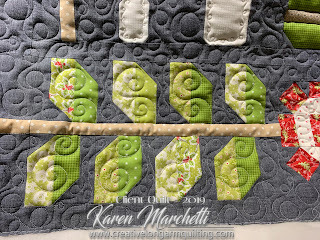 I also used Gina Perkes-Tidwell's medium June ruler to do the continuous ovals in the curved sashings. 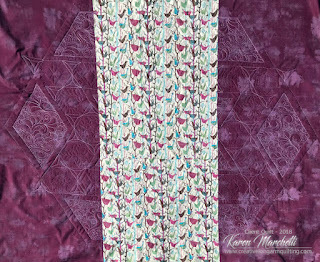 Aren't these the coolest feathers! 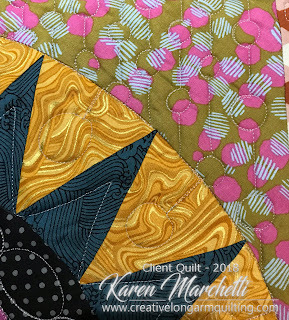 They are in my about-to-be-finished book, Fast Forward Feathers -- watch here for pre-sale and release dates (it'll be very soon)! 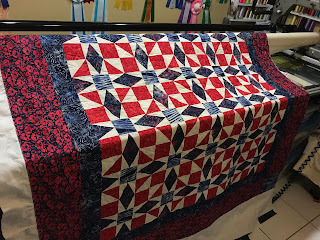 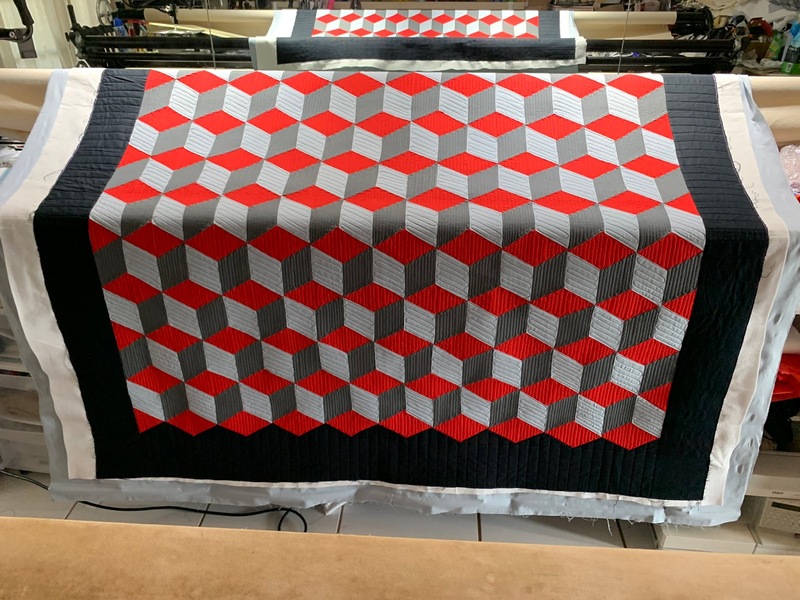 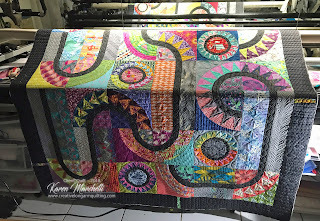 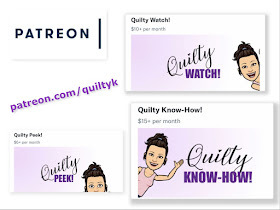 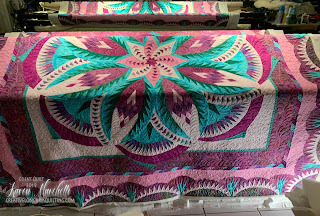 If you want to see a video of the stitching on this beauty, subscribe to my Patreon account - https://www.patreon.com/quiltyk. 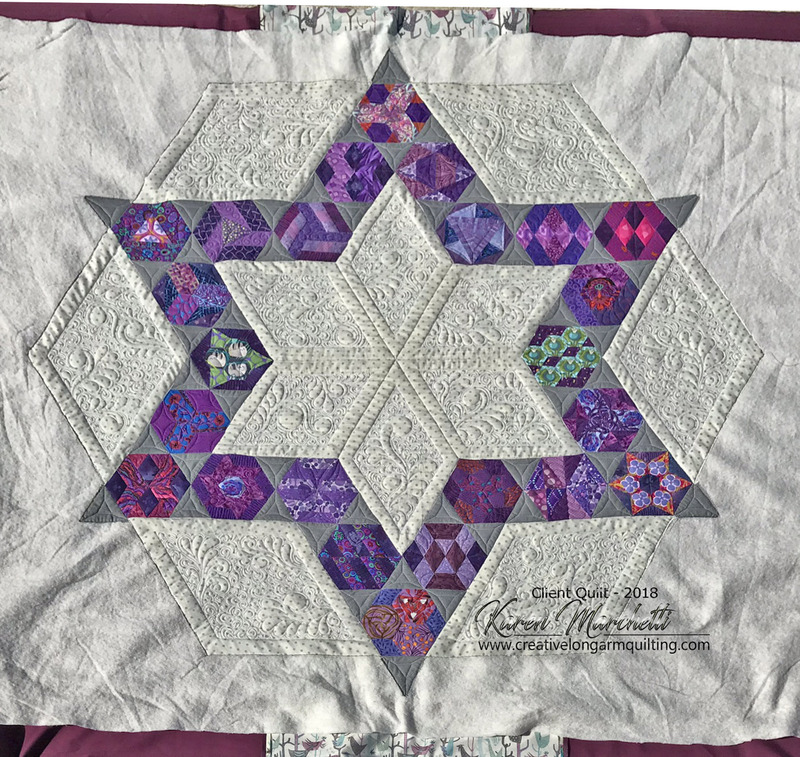 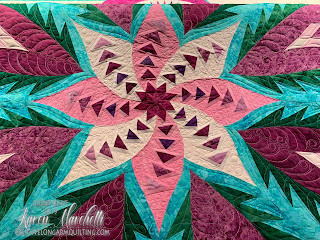 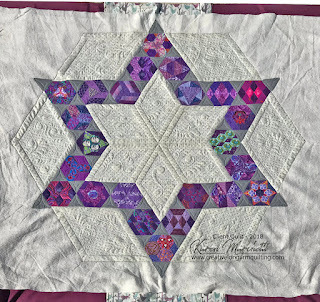 I finished Silvia's Wish Upon a Star quilt (EPP block patterns by Katja Marek). 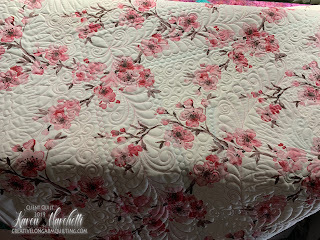 And no, I didn't trim the batting/backing from this one -- it is easier to attach the binding when there is a bit of an edge left on the quilt. And if you want to see some of the background fill and stitching of blocks, you can subscribe I share lots of stuff over there!